Tim Duncan, Gregg Popovich and R.C. Buford: Three names that are synonymous with the San Antonio Spurs’ championship successes. But there’s another name you might not know, that of a St. Mary’s grad who has been there for every one of those title runs. 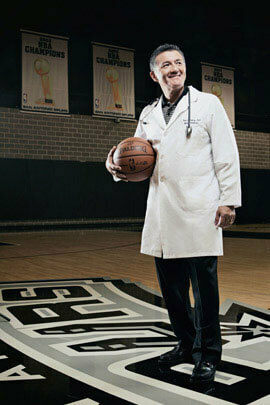 Meet Paul Saenz, D.O., the Spurs’ team physician — the man the Spurs have never won a championship without. And there are few as good as Saenz. A San Antonio native who graduated from Central Catholic High School, Saenz received his bachelor’s in Biology from St. Mary’s. He went on to pursue dental school for two years before realizing his true passion was medicine, so he switched paths and received his medical degree at the Texas College of Osteopathic Medicine in Fort Worth. He founded Sports Medicine Associates of San Antonio in 1992 before joining the Spurs organization during the lockout-abbreviated 1998-1999 season. Since then, the team has gone on to win four NBA titles and post an NBA-record 13 straight seasons of 50-or-more wins. Saenz happens to be involved with other successful sports programs, too. He will travel with the U.S. Olympic basketball team this summer as the team physician for a pre-Olympic tournament that includes games in Manchester, England and Barcelona, Spain. He also now serves as a national team physician for the U.S. track and field squad — this after having held the same position with the U.S. Olympic boxing team in 1996 and with the U.S. pentathlon team in 2004. In addition, Saenz is in his 19th year as the San Antonio Missions’ team physician, dating all the way back to when the team played its games at St. Mary’s V.J. Keefe Field, and is on the medical staff with San Antonio’s professional hockey and women’s basketball teams. As if his four NBA titles with the Spurs weren’t enough, Saenz has also been part of four Texas League-champion Missions squads. It’s enough to draw some good-natured ribbing from his peers in the medical profession. But, Saenz admits, “I’m a basketball fan at heart.” And there’s nothing quite like the adrenaline rush created by walking into an opposing team’s arena on game nights. “Our traveling party typically includes 35 people between players, coaches, doctors and training staff, strength staff and necessary public relations people,” Saenz said. His passion for the sport dates all the way back to his days at St. Mary’s. Saenz’s time on campus intersected with that of Robert Reid, the St. Mary’s Athletics Hall of Fame basketball player who went on to enjoy a lengthy NBA career. They crossed paths again years later, when Saenz happened to be attending a banquet at which Reid was being honored. “I did relay to him that I was a big fan of his and was very proud to see how accomplished he was,” Saenz said. The same could be said for Saenz.